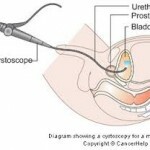 A cystoscopy allows your doctor to check the inside of the urethra and bladder. 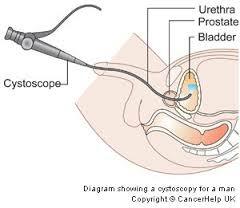 During the procedure, the physician uses a thin lighted instrument which is called a cystoscope. The purpose of the test is to gain access to areas of the urethra and bladder that don’t show up on X-rays. Your doctor may order a cystoscopy in order to find the cause of several urinary problems, such as incontinence, blood in the urine, repeated urinary tract infections or to look for problems in the urinary tract such as tumors, kidney stones, or an enlarged prostate in men. When the doctor performs a cystoscopy, they have the ability to use tiny surgical instruments to remove samples of tissue for biopsy, remove foreign objects, place catheters or treat other urinary problems in an effort to avoid more extensive surgeries. The procedure is performed by a urologist and patients are put under sedation with either a local, general or spinal anesthesia to help the patient relax and sleep during the procedure itself. The test itself shouldn’t cause much discomfort, you may have a burning sensation or a fullness and urge to urinate. Most often you will only feel groggy and perhaps slightly nauseous from the anesthesia. A cystoscopy holds a very low risk of problems caused by the surgery and is generally considered a very safe test.